I had a ham hock sitting in the freezer for yonks and I thought I better use it up. Not wanting to do soup, I thought it might be tasty with some homemade baked beans. I was right! The combination of the ham with the molasses gives the beans a delicious, smokey barbecue flavour. This batch will make a lot of beans, so freeze some for an easy dinner one night. They are yummy just on toast or pop into some ramekins, crack an egg on top, sprinkle with fetta and bake in the oven until the egg is cooked to your liking. Honestly, this recipes is so, so easy and once you try homemade baked beans, you will never buy another can of beans. Besides the fact that canned baked beans are usually high in sugar and salt and may contain maize starch, thickeners and msg! Yuk! Finely chop the onion, celery, carrot and garlic. Cook in your fat of choice in a big pot, over a medium heat until the onions are cooked and translucent. Add the tomatoes, ham hock, tomato paste, bone broth, molasses and bay leaves. Simmer for two to three hours with a lid on, until the meat is falling off the bone. Keep stirring and add some filtered water if necessary or leave the lid off and let the sauce reduce to the consistency you like. It will depend on how big your pot is. Chop the meat off the bone and dice finely. Add back into the pot with the beans. Cook for another ten minutes or so to heat the beans and coat well in the sauce. Season to taste with salt and pepper and remove the bay leaves. *If you don’t have a ham hock you could use bacon bones or just some nice organic bacon, diced finely. Just adjust cooking times to suit. *Add one tablespoon of smoked paprika for a yummy barbecue taste. 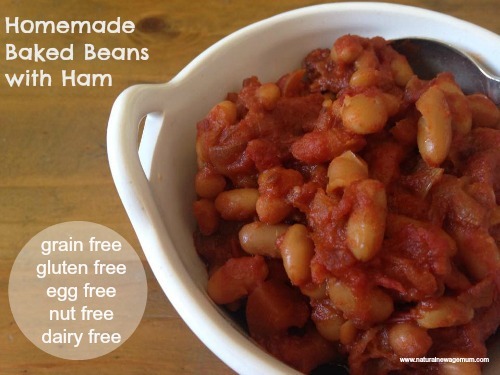 Have you ever made homemade baked beans? What did the family think? Yum! Will definitely be trying these! when i am able to find beans (dry) i make it from scratch and it is even yummier. similar ingredient (except for the organic molasses or use rapadura sugar) and i add a chorizo. I know… but you dont even need to eat it. I bet you make an awesome paella! This recipe is to die for! Loved it and so did my whole family. It freezes really well also, which I’ve done in small batches for a quick, yummy and warming breakfast.